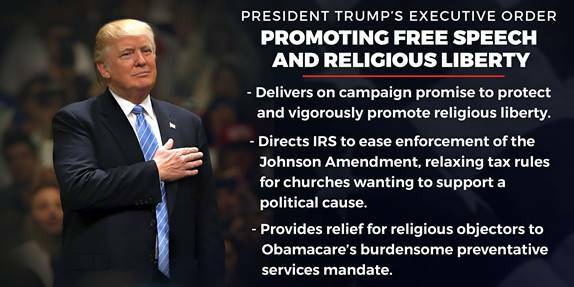 Yesterday, President Trump issued an Executive Order on religious liberty. The Executive Order cheered many conservatives who had expected some action on religious liberty during the President’s first 100 days. With this executive order, the Trump Administration is making clear that the federal government will never penalize any person for their protected religious beliefs. It will be the policy of the administration to vigorously promote religious liberty. Provide regulatory relief for religious objectors to Obamacare’s burdensome preventive services mandate (requiring coverage of reproductive services), a position supported by the Supreme Court decision in Hobby Lobby. Direct all federal agencies and departments to protect religious liberty and free speech, consistent with guidance to be issued by the Department of Justice. The part of the Executive Order through which the President has directed the IRS not to enforce The Johnson Amendment, which under law it could use to deny or revoke a church’s or nonprofit’s tax-exempt status if that church or nonprofit chooses to support a political candidate or cause was especially important to conservatives. The Johnson Amendment violates the First Amendment’s Free Exercise Clause, which prohibits the government from regulating religious organizations more strictly than their secular counterparts, and the Free Speech Clause, which prohibits the government from regulating speech based on its content. It also violates the Religious Freedom Restoration Act, a 1993 federal statute that prohibits the federal government from imposing a “substantial burden” on a religious organization unless the government demonstrates that it must impose that burden to achieve a “compelling government interest.” It also, could violate the First Amendment’s Establishment Clause by requiring the IRS to scrutinize sermons or other religious messages, thus excessively entangling government and religion. Conservatives have long maintained that pastors should be allowed to utilize their first amendment rights and preach according to their conscious and the word of God, without the threat of legal interference for doing so. Perhaps of equal importance to the Johnson Amendment language in the Executive Order was the President’s commitment to renew enforcement of the Religious Freedom Restoration Act (RFRA). This Executive Order enforces that law, already on the books, that Barack Obama refused to enforce. In America, we do not fear people speaking freely from the pulpit. we embrace it. America has a rich tradition of social change beginning in our pews and our pulpits. Perhaps there is no greater example than the historic role of the African-American church as the agent for social progress, spurring our nation to greater justice and equality. We must never infringe on the noble tradition of change from the church and progress from the pew. Under my administration, free speech does not end at the steps of a cathedral or a synagogue or any other house of worship. we are giving our churches their voices back and we are giving them back in the highest form. with this executive order, we also make clear that the federal government will never, ever penalize any person for their protected religious beliefs. That is why I am today directing the Department of Justice to develop new rules to ensure these religious protections are afforded to all Americans. It is this last point that is perhaps the most important element of the President’s Executive Order on religious liberty, because it was through the Department of Justice that the Obama administration wreaked most of the destruction of religious liberty we saw over the past eight years.